"Let me be frank with you - I've been to hell… And I know things that don't disturb other people's dreams." Kino Lorber has debuted a new official US trailer for a French-Italian drama titled Pasolini, which actually first premiered back in 2014 and is just finally getting a US release. This "kaleidoscopic look at the last day of Italian filmmaker Pier Paolo Pasolini" first showed at the Venice Film Festival in 2014, and then opened throughout Europe in 2014 and 2015. After five years of waiting, it's finally getting a small theatrical release this May. 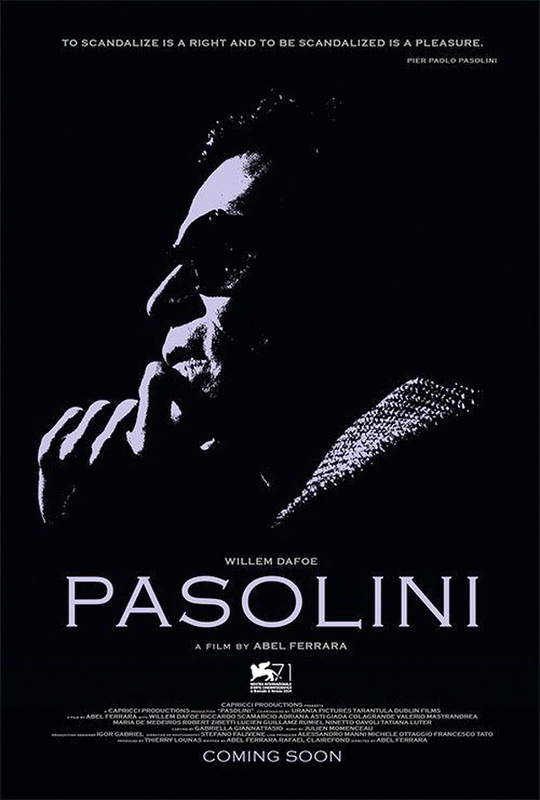 Directed by filmmaker Abel Ferrara, Pasolini stars Willem Dafoe as Pier Paolo Pasolini, along with Ninetto Davoli, Riccardo Scamarcio, Valerio Mastandrea, Roberto Zibetti, Andrea Bosca, and Damiano Tamilia. It seems a bit odd to still try and release this film after so many years, but if they think it's worthy of another release, then why not. The footage looks intriguing, especially for Pasolini fans. The Roman life and the imaginary worlds of Pier Paolo Pasolini intermingle in Abel Ferrara's retelling of the final days in the life of the fifty-year-old filmmaker and writer, in a lovely, haunting film that draws on his last interview and envisages scenes from an unmade final film and his incomplete novel, Petrolio. Willem Dafoe, regally exhausted, is the spitting image of the murdered director, and Pasolini's beloved muse Ninetto Davoli returns to "finish" his friend's work, but Ferrara wisely never attempts to merely ape Pasolini's style, instead offering one iconoclastic artist's tribute to another, a biopic that busts the boundaries of the form and a passion project decades in the imagining that gives Pasolini's final moments on the beach at Ostia the terrible sanctity of the Passion. Pasolini is directed by veteran American filmmaker Abel Ferrara, of films including The Driller Killer, Ms .45, Fear City, Crime Story, China Girl, Cat Chaser, King of New York, Bad Lieutenant, Body Snatchers, Dangerous Game, The Addiction, Chelsea on the Rocks, 4:44 Last Day on Earth, and Welcome to New York. The screenplay is by Maurizio Braucci, based on an idea by Abel Ferrara & Nicola Tranquillino. Kino Lorber will finally release Ferrara's Pasolini in select US theaters starting May 10th, 2019 this summer. For more info, visit the official website. Anyone?